General: Tofo's showcase dive. World famous for the two Manta cleaning stations, first discovered by Carlos do Rocha in the 1960's. Since then this site has attracted marine biologists, cameramen and divers from around the world. A gentle drift dive from North to South, your dive begins with a negative entry into 26m into the middle of a small amphitheatre teeming with life. The dive progresses through a series of pinnacles before the first cleaning station is reached, a shallower (21m) sandy area. At this cleaning station Mantas circle overhead to be cleaned by Goldies, Cleaner Wrasse and Butterfly fish. In good visibility this dive is amazing with upwards of ten Mantas circling overhead. Even in poor vis the sight of Mantas appearing from the mist above you is haunting and a moment to be cherished. At the end of the dive your ascent is often accompanied by groups of inquisitive Devil Rays wheeling about your safety stop. This dive is a must do in Tofo. Because of the depth this is only suitable for advanced divers but is a favourite for people completing their advanced course or deep adventure dive. 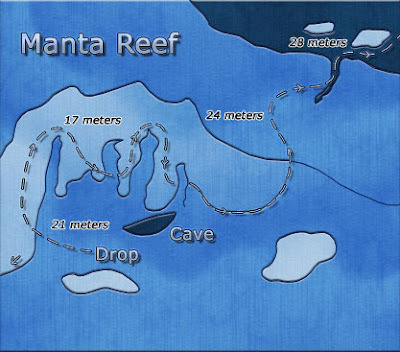 So, the famous Manta Reef! Ty, our Divemaster, tells us it will be about a 25 minute drive out to the site. This was slightly optimistic, as we have to smash our way directly against the enormous swell, it must be at least 45 minutes journey, and there’s so much spray battering the boat that I put on my scuba mask, and at one point get bashed off the edge into the boat by what I would describe as a wall of water rather than “spray”. After the usual negative entry, at the bottom I realise my SPG, the gauge which tells you how much air you have left, and your depth, is leaking bubbles. Not confidence inspiring! I signal to Ty, who I am buddied up with, but he says it will be fine. Suit very tight too. Damn rented equipment. Anyway, this site is a cleaning station for the Manta Rays which, along with the Whale Sharks, are what makes diving here. Unfortunately we see none during this dive! Otherwise though it’s a nice dive, with lots of interesting smaller stuff, including radial lionfish, scorpionfish, and an enormous orange nudibranch called a Spanish Dancer, the size of a large cucumber. Nudibranches are strange creatures which one only finds underwater. Their name means “Lungs on the outside”, and they come in all colours, shapes and sizes, but generally are small. On the way back, which was slightly easier than outbound, Ty suddenly yelled to stop the boat – Whale Shark! We all grabbed our mask and fins and jumped in! He was a big shark, but unfortunately swam away as soon as we were in the water. Still, my first sighting!! Back to base and it turns out my next dive – Chamber of Secrets has been postponed. Instead Steve books me on to another dive going to Salon later, hopefully by which time the swell will have reduced somewhat. I have lunch with a couple of nice Norwegian chaps. The food at the dive centre’s café is really good in fact, not cheap, but tasty. Though due to the power being out, I don’t get chips with my tasty blue cheese burger! Hard life, eh? A French guy on our table goes for a second burger. I shake his hand in admiration, but resist temptation. I’m supposed to be diving using buoyancy control, not belly weight! Then I’m told – potentially there will be no more dives today because of the power out – their compressor they use to fill tanks is out of action. I hang around hoping, and am rewarded – they find a couple of spare tanks with air and I’m going diving! Finally, a site which is not so far, and also to the North, so we don’t hit the swell on the way out. I’m buddied with Henry, a Swiss-German photographer. He has the same camera as me, as in the one that I’ve broken. We do a negative entry. The current is quite strong this time, which is tiring. I also find that my weighting doesn’t seem right – perhaps because the suit is quite large and some air is getting into it. I have trouble staying down, and a leaking mask again! Grrrr! Then Lars, a nice German chap who I was talking to before the dive, kicks me square in the nuts! Frankly, there are too many people diving in this dive! There’s a 12 year old girl with us too, she’s apparently been qualified for 2 years already! So, that all said, it was a quite nice dive. I saw Kuhl’s Rays, a couple of Porcupine Fish, some nudibranches, and Moray Eels, in both Black Cheek and Yellow Edge varieties. After the dive, I enjoy a beer, reading H W Tilman in one of their hanging seats, watching the sun go down as a storm comes in, cooling things in. The evening passes amicably in Bamboozi bar, I notice that they have a board game called Bamboozle, perhaps the place was named after this game? On their television I see West Ham beat Manchester United, which of course identifies all the Brits in the bar in their jubilation. Then once again I retire early – 7am dive the following day after all. I wanted to replace my mosquito net, but contrary to what reception told me they have no nets behind the bar, so I repair the only hole I can see and seal up my bed, tucking the net in under the mattress all the way round. Again, overnight I am eaten ALIVE! This is too much… even when coated with mosquito repellent. I just can’t sleep properly like this. I abandon the net and use my sleeping bag liner, trying to seal myself in, something I can only do as luckily it’s not too hot, but still enough to sleep badly. So I’m up at 6:15am, and out for my final dive, leaving Tofo Scuba at 7am.